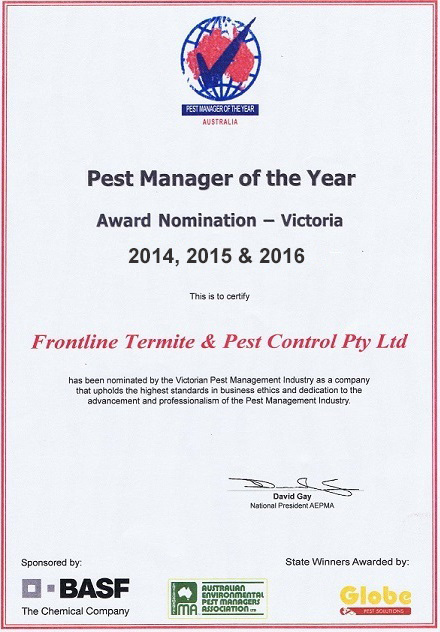 Frontline Termite & Pest Control is a non franchise family-run business in Melbourne. We have 20 years experience in the industry. We specialise in termite treatment and termite control in Melbourne in both new and established homes, Commercial, Domestic and Extensions. This company guarantees all work related to termite services and termite treatment and we are fully insured. We are available on weekends for your convenience and offer fast, efficient and courteous service. Frontline Termite & Pest Control specialises in the removal of more than just termites. All technicians are Department of Health & Services Licenced and all are accredited with the Red Card. Frontline Termite & Pest Control also has four registered Termidor® Applicators. Pest Control and Termite protection in Lilydale, Melbourne Eastern Suburbs and Yarra Valley.